CNG: Printed Auction CNG 75. ELIS, Olympia. 97th Olympiad. 392 BC. AR Stater (11.76 g, 12h). Hera mint. Sale: CNG 75, Lot: 313. Estimate $750. ELIS, Olympia. 97th Olympiad. 392 BC. AR Stater (11.76 g, 12h). Hera mint. 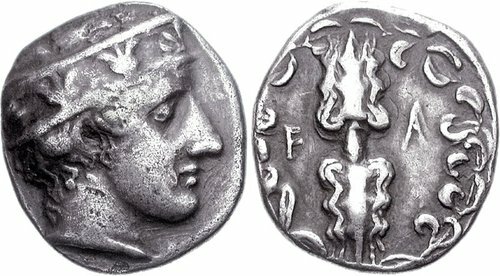 Head of Hera right, wearing ornamented stephanos / Flaming thunderbolt within wreath. Seltman, Temple 273 (dies EJ/hf); BCD Olympia 91; SNG Copenhagen 381. Fine, toned, surfaces lightly smoothed, a couple light marks.